Every year, half a million of the world's children go blind, according to the World Health Organization; 75 per cent of them live in developing countries such as Madagascar, an island nation off the coast of eastern Africa best known as the setting of a popular animated film. His ragged sweatshirt has "Life is Wonderful" in bold letters across the chest. Yet life is anything but for nine-year old Jean-Claude Tafitaheriniaina. Corneal scarring he contracted from a fungal infection left untreated has rendered this boy, from a poor family in the central highlands of Madagascar, virtually blind -- only able to decipher shadows and light. Clutching his grandmother's wizened hand, Jean-Claude winces as the ophthalmologist examines his milky, sightless eyes. 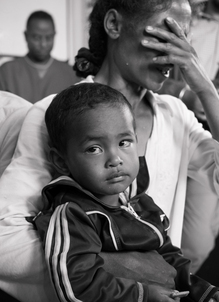 She has brought him to this outreach "eye camp" in the Malagasy village of Mandrosohasina hoping for a miracle. Melline Razafiatarisoa, a nearly destitute middle-aged woman blinded as a child by congenital bilateral cataracts, also has hope. Abandoned by her husband when she gave birth to two children with the same affliction, she hopes that the eye doctors can save her two-year-old son Rodia from repeating her fate. Every year, half a million of the world's children go blind, according to the World Health Organization; 75 per cent of them live in developing countries such as Madagascar, an island nation off the coast of eastern Africa best known as the setting of a popular animated film. Yet almost half of all blindness in children -- particularly those in the poorest communities -- is avoidable if they have access to care. On this day over a hundred poor rural folk -- from the elderly to infants -- arrive at Mandrosohasina's community centre on a hill overlooking shimmering emerald fields of rice. They've come, like Melline and Jean-Claude, seeking a way out of the darkness that plagues them and their loved ones. Many have walked or ridden ox carts for days through mountainous terrain lashed by torrential rainy season downpours. Awaiting them is a medical team led by one of Madagascar's top ophthalmologists, Dr. Richard Andriamampihantona, along with members of Vancouver-based charity Seva Canada. Seva works to prevent blindness, restore sight, and transform lives in developing countries. 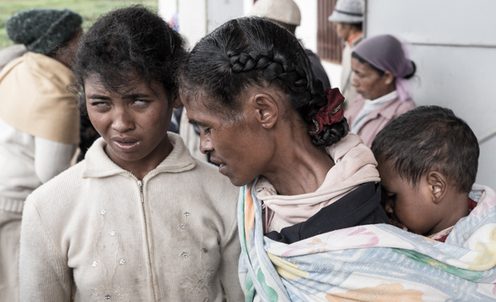 Seva is funding this outreach eye camp, along with other programs in Madagascar designed to overcome barriers that women, children, the very poor, and those living in rural areas face trying to access care. 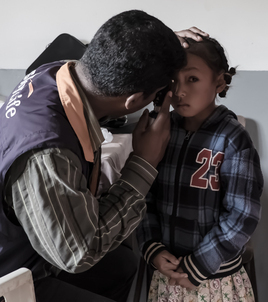 "Seva Canada works the same way everywhere, helping people to solve their own problems," explains Seva's program director Dr. Ken Bassett, a professor of medicine at UBC and director of a research program in international and epidemiologic ophthalmology. All of Seva Canada's work in Africa is done through the Kilimanjaro Centre for Community Ophthalmology (KCCO), an institution that Seva Canada helped establish in 2001. 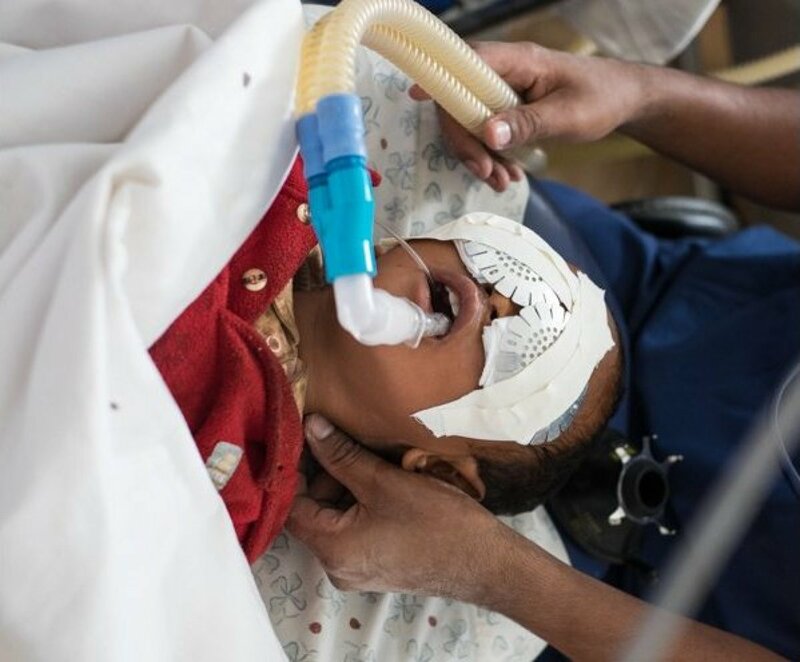 KCCO is the only community ophthalmology training institution dedicated to reducing blindness in Africa. Watching the hopeful line up to be examined, Bassett explains that Seva doesn't just come in and tell partners like KCCO what to do. "It's about providing assistance, training, equipment, and lessons from other places," he says. To this end, Seva Canada supports KCCO in strengthening African eye care programs with an emphasis on capacity-building, outreach, pediatric care, gender equity and universal access to eye care services. Over many hours, Dr. Richard (as his staff affectionately calls him) prescribes corrective eyeglasses, eye drops, and other remedial solutions, distributed on the spot. Those who can pay a little subsidize those who cannot. It's a sustainable model Seva has employed effectively in many countries where it operates, including Tibet, Nepal, and Cambodia. More serious cases that Dr. Richard marks for sight-restoring surgery often take convincing. "Half of the people I screen are still afraid of the operation," he explains, while examining a teary-eyed girl of seven named Lalaina for signs of glaucoma. "They are afraid that they will become blind if you touch their eyes." So sometimes he has to tell older people who have never benefited from hospitals or doctors that it is just like washing out their eyes. Extreme poverty is also a major obstacle to obtaining eye care in developing countries, where the harsh realities of rural life often render a helpless blind person little more than "a mouth with no hands". "Even if the operation is offered for free, the transportation costs can be too much for these people," says Dr. Richard. "Even five dollars can be too much." With Seva's help, Dr. Richard arranges to transport Lalaina, Jean-Claude, and Rodia, along with their families, to his hospital in Antsirabe, where he will operate on them early the next morning. It's a journey into the unknown for these children, who've never been to the city, let alone in a hospital. First up is Lalaina, the girl he diagnosed with glaucoma, who waves bravely as she enters the operating room, trembling to hold back her tears. After examining her, Dr. Richard elects to postpone the delicate procedure needed to relieve pressure destroying her optic nerve. He won't risk surgery unless her condition deteriorates, because going under general anesthesia is much more traumatic for children. "Now this girl has to accept that she has a chronic vision-threatening condition that will demand a lifetime of special care," explains Ken Bassett as Lalaina is carried out of the operating room. "It will take a lot of time and ongoing education to help her and her family understand that and agree to the follow-up treatments." Basset adds that preventing avoidable childhood blindness also involves identifying and managing congenital or developmental cataracts -- along with vision- or life-threatening problems such as ophthalmia neonatorum, congenital glaucoma, and retinoblastoma -- as early as possible. For Jean-Claude, the boy with severe corneal scarring, life will not turn out wonderfully, despite what his sweatshirt declares. After putting him under and probing his eyes, Dr. Richard halts the surgery. "Unfortunately I can do nothing for him," the ophthalmologist says, his voice nearly drowned out by the wails of children emerging from anesthetic in the recovery room down the hall. "His only chance now is a corneal transplant, which isn't yet possible in Madagascar." Bassett explains that had this boy been examined only a few months earlier, and simple antibiotic and anti-fungal drops given to him before the infection spread, he almost certainly would not have developed the binding scars on his corneas, and his sight likely would have been preserved. It's a tragedy repeated all too often in countries where the poor have little access to care, or won't seek proper medical help due to superstitions and reliance on traditional healers. Told that he will likely face a lifetime of blindness, Jean-Claude reacts not with more tears, as one might expect. Instead, this boy who has already had so much taken from him -- including his mother, struck and killed by lightning while toiling in the fields -- silently absorbs the bad news, then begins to serenely recite the Lord's Prayer in Malagasy, his soft voice rising, drawing courage from some power beyond rational understanding. 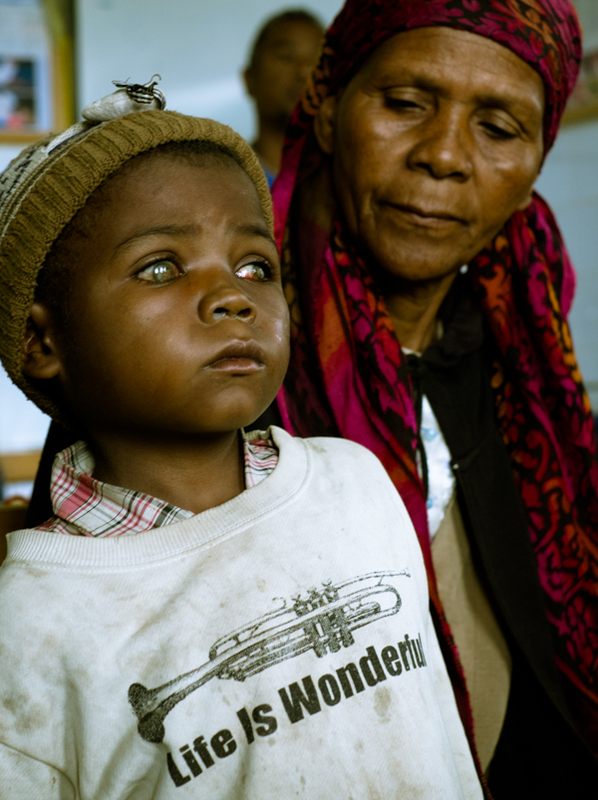 It may be too late for Jean-Claude, but somewhere in Madagascar the prayers of other children afflicted with preventable blindness will be answered because of the efforts of dedicated ophthalmologists like Dr. Richard, supported by Seva. 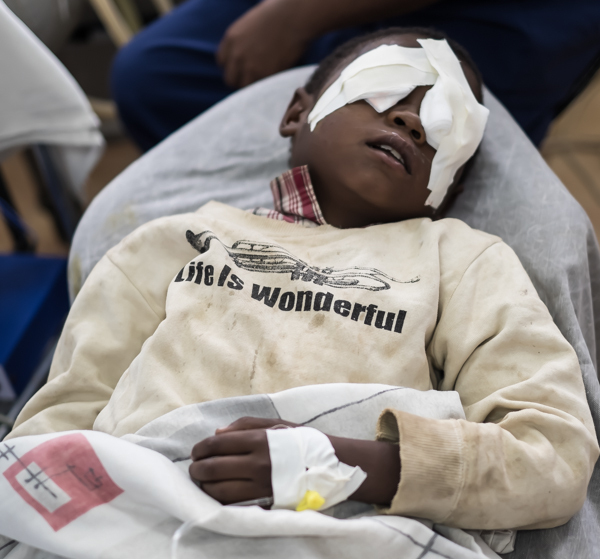 Thankfully, Rodia's cataract operation is a success. His vision will continue to improve as his eyes and brain start to communicate together better. The next morning, after his bandages are removed, he is able to see his mother and sister for the first time. Learning of this medical miracle, Melline rejoices and bursts into song -- a Malagasy hymn of praise that Rodia also starts to hum. There's not a dry eye in the room. Now Melline's only son, and her family's hope, will have a chance to avoid her fate. It's said that the eyes not only allow you to function in the world, they also show you the light of the world. Nowhere is that light shining more brightly than in the restored eyes of this Malagasy child who once was blind, and now can see. A Vancouver based charitable organization dedicated to fighting blindness and restoring sight in 13 of the world's poorest places, Seva Canada has helped more that 3.5 million people see again since it was founded in 1982. Together with two partner organizations, it was recently awarded the 'Nobel Prize of vision care' -- the prestigious 2015 António Champalimaud Vision Award. Click here to see how you can help. This story originally appeared in MONTECRISTO Magazine.